Faros is located in the SE Sifnos and it is considered to be the safest port of the island, and had been up to 1883 the official port. 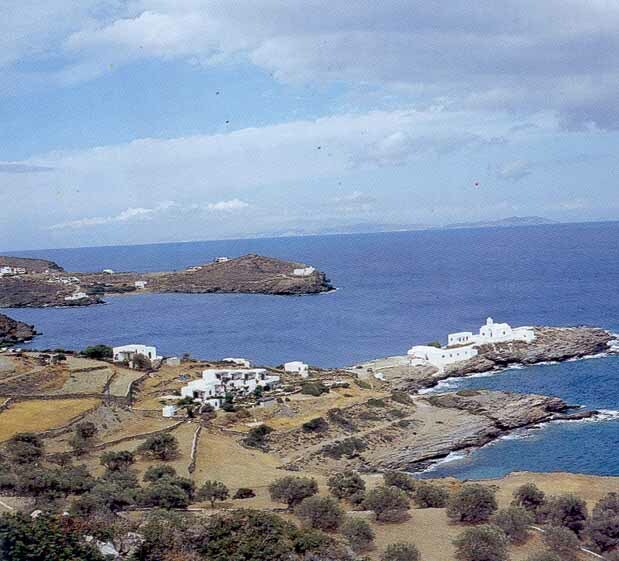 It is a peaceful fishing village with picturesque continuous sandy beaches: Fasolou, Faros and Glyfos. Near the entrance of the port lies the “petrogoleta” of Chrisopigi, a rocky island that is severed from the land and on which is located the monastery of Panagia of Chrisopigi, the protector Saint of Sifnos. On the west side of the bay, the remnants of the installations for the shipping of ore, for its transportation and processing at Lavrio, are preserved. The local name is obviously due to the installation of a lighthouse, a large coastal lantern in the entrance of the port, to be used in navigation. This lighthouse is at present located on the right side of the port and on the side of the monastery of Stavros, from which the view is unique.